Caribbean Christian Publications provides culturally appropriate evangelical Bible and church related materials and resources to English language churches of the Caribbean Basin. Stop trying to plan Bible-related lessons on your own. Avoid the culturally irrelevant materials from other countries and support your Caribbean family. See our Publications Page for a full listing of our materials. 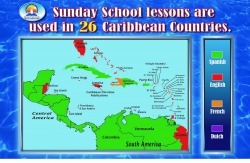 Be sure to check out our popular Caribbean Bible Lessons and Resource Packet for use in Sunday Schools. Caribbean Christian Publications is working to become a self-supporting ministry. Income from the sale of teacher and learner guides account for about two-thirds of our small annual budget. The remainder comes from subvention and gifts from a few churches and individuals. If you would like to aid in the growth of CCP, visit the “Partner With Us” page. Caribbean Christian Publications is the publisher of Caribbean Bible Lessons, age-graded Bible study materials for use in Sunday Schools; and other church Bible-teaching programmes. What began as an idea at a dinner table in Jamaica 35 years ago has blossomed into the leading Sunday School literature ministry serving Caribbean area churches of many denominations. Would you and your church like to make a difference in the lives of Caribbean people?